Tyler Bozak wired a centering feed from along the right-wing boards to Schwartz, who batted the puck out of the air and past Connor Hellebuyck to stun the crowd in Winnipeg. The Blues will look to close out the best-of-seven series at home on Saturday night. St. Louis overcame a 2-0, third-period deficit as Brayden Schenn collected a goal and an assist and linemate Ryan O’Reilly scored on the power play. Rookie Jordan Binnington finished with 29 saves for the Blues. Petr Mrazek made 30 saves as Carolina evened the series against Washington with a victory in Raleigh, N.C.
Warren Foegele, who scored on the game’s first shift, and Teuvo Teravainen notched goals for the Hurricanes, who never trailed for the second straight game. The Golden Knights, up 3-2 in the best-of-seven series, will try again to clinch in Game 6 on Sunday in Las Vegas. Joe Pavelski had a goal and an assist, and Logan Couture and Barclay Goodrow also scored goals for San Jose. Jonathan Marchessault and Reilly Smith scored for the Golden Knights. RALEIGH, N.C. — Teuvo Teravainen scored the go-ahead goal with 27.9 seconds left in the second period, and the Carolina Hurricanes beat the Washington Capitals 2-1 on Thursday night to even their playoff series at two games apiece. 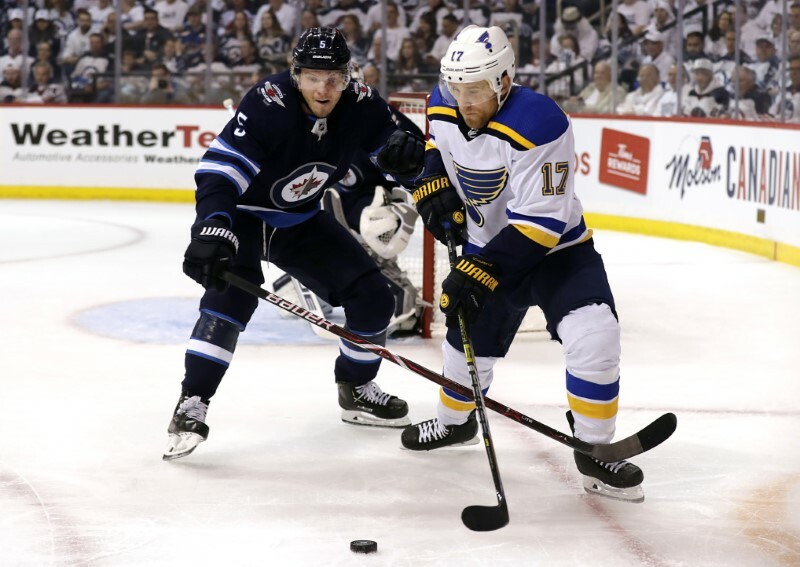 Jaden Schwartz scored with just 15 seconds to play Thursday night, giving the Blues a 3-2 win over the Jets in game five of their series in Winnipeg. Jaden Schwartz scored with 15 seconds remaining in the third period, lifting the Blues to a 3-2 victory over the Winnipeg Jets on Thursday and handing St. Louis a 3-2 series lead.